It has come to our attention that many of our competitors are changing the name of their lifts to make them sound like Lift King car lifts. Some are even going so far as to change their company logos to resemble ours. We learned this after one of competitor’s clients called us for warranty work on a unit he had purchased the month before. He believed he’d purchase a genuine Lift King, but unfortunately it was a cheap imitation, so we could not help the gentleman, and he was stuck with his lift. Across Canada, Lift King is synonymous with quality and service, and unfortunately, some companies who are desperate to compete are now resorting to these disreputable tactics to sell their units. And sadly, it’s the hobbyists and enthusiasts who are getting hurt. 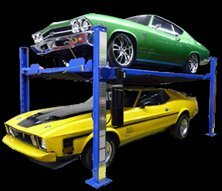 While we understand that, “Imitation is the highest form of flattery,” and we do appreciate the compliment, we also want anyone looking for the best car lifts in Canada to not be cheated by liars. It’s nice to know that these companies regard our products as the highest standard, but it’s also important that the public knows that they can only buy a genuine Lift King car lifts from an authorized Lift king distributor or directly from Lift King stores. If you have any concerns regarding whether you are receiving a true high-quality Lift King, we’ll be able to show you exactly where our lifts say Lift King! Remember, if it doesn’t say “Lift King”, it’s not the real deal!